How-to videos are nothing new but relevant, snack-sized, DIY videos that manage to secure 52 million likes and over 2.2 billion views are a special kind of marketing magic. The story behind Tasty’s success is an excellent how-to in and of itself: a guide to dominating a niche audience in a mixed media world. 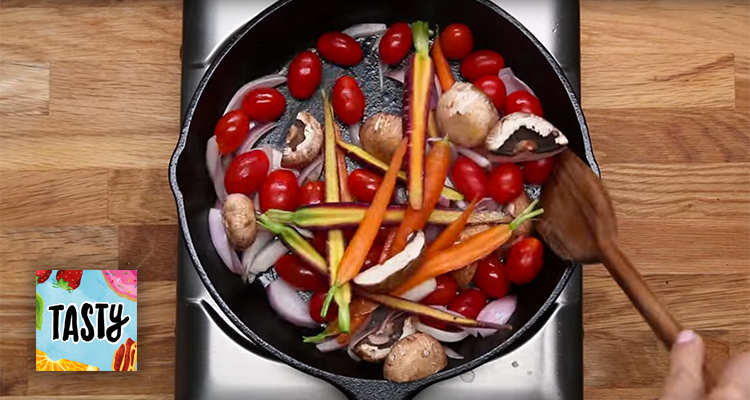 Food lovers and rookie cooks alike rejoiced when Tasty videos began to make the Facebook rounds last year, a video series byproduct of Buzzfeed. Even if you haven’t officially “liked” the brand’s page, chances are you’ve come across one of its posts. “Tasty videos tap into a simple truth: People love tasty foods and the kind of foods that remind them of their childhood, comfort food, or food that reminds them of an experience,” says Buzzfeed’s CMO Frank Cooper. We all know that food is a universal language, but Tasty videos offer an appeal that transcends the taste buds: an emotional connection. We’re no strangers to cooking shows, but what sets Tasty apart from the televised (and often idealized) kitchen production is no-frills, accessible, and – dare we say – bite-size approach to information sharing. The first-person POV puts viewers in the position of the chef and motivates them to live out the action themselves. What’s more, the simple overheads and quick-paced cuts between shots helps to make viewers feel capable of actually replicating the recipe in their own kitchen (something not typically felt when watching a high-stakes show televized from a professional kitchen). Lesson: Tell your story with empathy. Learn your audience’s needs and desires, and demonstrate that you’re a brand who puts your fans’ cares before your own. We have it baked into our marketing minds that most – if not, all – of the social media posts we push out should be punctuated with a CTA that drives visitors back to our website. While this certainly is a best practice – and a constant of lead generation content– the launch of Tasty has demonstrated the value in hosting content directly to a social media network. Buzzfeed decided against posting links to drive people back to its website, placing precedence on the virality of its content. They recognize that we’re all in Facebook for a reason and that, for many, it can feel like an inconvenience to click out of it. Facebook is notoriously hush-hush about its algorithmic formula, but social media monoliths like Buzzfeed (who arguably gave rise to cat videos) are well acquainted with the metrics of viral video success. Posts with high engagement are typically rewarded with top News Feed placement. It has always been in Facebook’s best interest to provide the best user experience in order to keep users around for as long as possible. Video standalones on Facebook are more likely to be favored than video posts that include site links. Lesson: Platform-exclusive content will usually outperform a one-size-fits-all approach. If you have limited resources, focus your energy on the one platform that best suits your brand and followers, instead of trying to cover all the platforms at once. “We were really thinking of audio independence. What kind of videos would work seamlessly within a product like that and allow you to share with your friends?” says President of Buzzfeed Motion Pictures, Ze Frank. Tasty videos need no introduction – literally. The step-by-step recipe videos autoplay in Facebook’s News Feed, and are muted by default unless the user manually turns the sound on. Thanks to captions that list required ingredients, Tasty eliminates the practical need for sound anyway. That isn’t the only element the videos have mastered: even though most videos feature multiple scene changes, they still clock in at less than a minute long. Tasks that require more time, like cooking meat, are displayed in fast motion. Convenience and mobile accessibility have quickly become the pillars of video content success. Short clips load faster, require less time to consume, and fold in nicely with a consumer’s fast-paced, on-the-go lifestyle. Lesson: Treat video as you would a landing page: optimize so you can build full campaigns around it to ensure it performs. While we don’t advise you holding your breath on going viral, you can certainly optimize your video content to ensure you drive traffic. There’s a long-held belief in the industry that a niche market is too small or too much trouble for large companies to seek out and cater to. Buzzfeed has worked hard to reach and target specific audience segments, proving that niche content can reach the same level of success that’s often associated with sharing content to the masses. The Tasty empire has spun off into other successful Facebook branches: Proper Tasty, Tasty Demaid, Nift, and Goodful. “We’ve looked at niche audiences and very specific topics and it spreads from there. It’s counterintuitive but it’s been a much more powerful impetus for sharing, as opposed to a spray and pray approach,” says Frank Cooper. Lesson: When you try to be everything to everyone, you quickly become nothing to no one. Knowing your customer’s pain points not only helps you keep content highly relevant to your audience, it’s also a great way to develop niche content that doesn’t already exist. Even without the support of Buzzfeed to promote your content, their formula to creating winning video content can be applied to even the smallest of businesses. Sign up for our free Social Media Marketing Assessment to see how your business can benefit from these lessons to build a video marketing program that drives the results you need.